Avoid Fad Diets, Follow Healthy Habits! From blue-tinted glasses that make the food look unappetizing to tapeworms that supposedly breakdown the food in your stomach, some people take whatever measure it takes to shed off those pounds on their bodies. But staying fit and healthy doesn't--and shouldn't--require you to rely on these often dangerous fad diets. Instead, Bon'App suggests sticking to a well-balanced diet and following healthy eating habits and nutritional guidance from Bon'App to achieve that beach perfect body before the end of summer! Does visually unappealing food make you eat less? That's the idea behind the Vision Diet, in which people eat food while wearing blue-tinted glasses that make the food look less tasty. However, there is no scientific proof that unattractive food makes you eat less...after all, you just need to close your eyes and the food will taste the same. This fad diet, developed by celebrity trainer Tracy Anderson, became an instant hit in Hollywood when stars reported losing weight by replacing regular meals with baby food. Even though pureed carrots, mashed bananas, and other soft food for the toothless are low in calories and contain no artificial flavors, baby food do not contain sufficient nutrients and fiber for adults to function on a daily basis. There is a reason they are called baby food! Developed in the 1920s, the Tapeworm Diet involves swallowing a worm-laced pill that hatches in your stomach. The tapeworms are thought to help you digest food faster. Yet, having these crawling creatures in your stomach may cause bloating, nausea, and diarrhea. Further, the worms could lay eggs in your nervous system, leading to seizures, dementia, and meningitis. These worm-laced pills are now banned in the United States. A new study shows that lack of sleep may cause weight gain. According to scientists at the Mayo Clinic in Rochester, Minn., a group of sleep-deprived participants consumed an average of 549 calories beyond their usual intake, while those who were well-rested maintained their normal caloric intake. Centers for Disease Control and Prevention recommends that an average adult gets between 7 and 9 hours of sleep. There is no need to deprive yourself of your favorite treat, like that piece of gooey chocolate brownies or juicy filet Mignon. Just be sure to watch your portion size and eat everything in moderation. For example, do not eat straight out of a bag of chips, a tub of ice cream, or a box of cookies. Instead, use measuring cups to control out how much you eating...and enjoy! 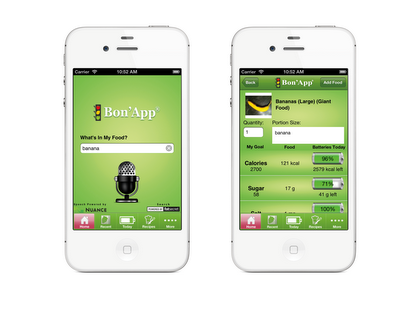 Simply download the Bon'App application on your smartphone or go to our website to keep track of what you are eating. With easy food entry through voice activation and a simple language of Calories, Sugar, Salt, and Bad Fat, Bon'App will completely change the way you think about food. You can enter individual food items or even create your own customized recipes – such as Grandma's Apple Pie – to find out how these items will impact you.